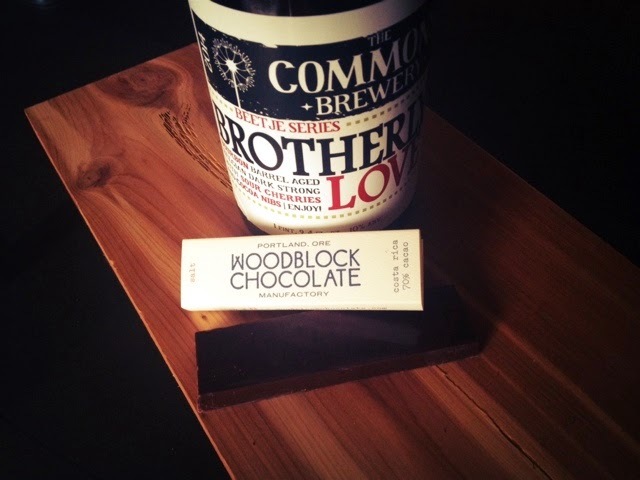 Brotherly Love Belgian Dark by The Commons Brewery in conjunction with Woodblock Chocolate. Wow, a hell of a beer. To date this is the best beer I've ever had. Back in March when Charley Wheelock handed me the bottle he said to wait awhile before enjoying. Take a sip, just hold it there. Slow down, relax, what does it remind you of? Think, breathe, relax, just taste. What do you taste? Cherry, chocolate, bourbon barrels, the wood. Chocolate nibs, not the sweet sugar of chocolate, deep cacao. Cherry, real cherry like the cherries warm from the sun right off the tree in my front yard. Complex yet wonderfully familiar flavors. Heaven. This must be what they serve in heaven. The Commons Brewery's Brotherly Love is brewed in Portland Oregon every February. Cacao nibs used in brewing Brotherly Love are sourced from Trinidad and Peru, than roasted by that talented character at Woodblock Chocolate, Charley Wheelock. The chocolate develops more as we sip. Dark but not bitter. Brilliant. Notes of roasted cocoa nib punctuated by bourbon barrels and cherries. Not a scent, real robust flavor. It looks like I'll be driving to Portland soon. I'm somehow finding more Brotherly Love. P.S. Charley Wheelock, I sincerely hope that you and your friends at The Commons Brewery will be brewing this again next year. Thank you for introducing us to to your fine work!